CASE STUDY OF HOW THIS APP CAN BE USED FOR MAINTENANCE REQUESTS YOU RECEIVE FROM TENANTS. As a Property Manager, you will create a Scanner code (QR code) for Service Request from the Scan-N-Track application. This SNTUID code will be sent by you to all your tenants for them to use. Permission to access the apartment. **Note, this can be customized by you at any time. You will set up each tenant in the system with their cell phone number (needed) and email id (optional). Since there are many tenants, you can upload their data via excel sheet. Each tenant downloads the free Scan-N-Track app from the Apple store or Google App Store on their cell phone. 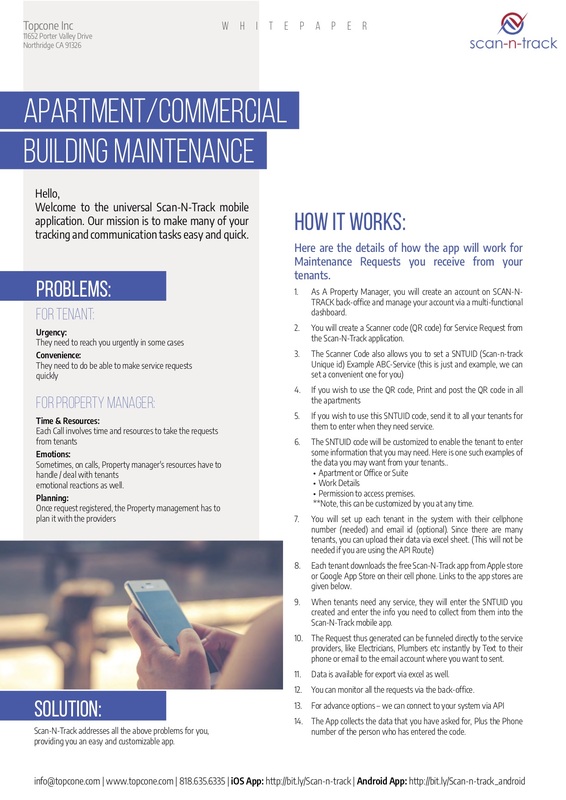 When tenants need any service, they will enter the SNTUID you created and enter the info you need to collect from them into the Scan-N-Track mobile app. The data thus generated will be sent instantly by email to the email account where you want to send. The App collects the data that you have asked for, Plus the Phone number of the person who has entered the code.